You’re coming down to the final stretch. You are almost finished with your classes and the parties seem to be spilling over from the weekends into the weekdays. Some of your peers are even cutting final classes, thinking that a passing grade is really all that is needed. So it’s pretty much a month long party. Right? The best way to spend your last month of college depends on your work status. If you have an entry level job (or internship, if you’re an undergraduate) already secured, perhaps you have time to party, although you still have some work to do. But if you do not yet have work secured, you still have work to do before the party begins. If you have your entry level job or internship secured, you should spend time preparing to hit the ground running in your new job, to be productive from day one. How do you do that? Simple. Ask your hiring manager what you can do to prepare between now and when you start. They may give you some research, reading, or prep work, all designed to help you get ready. And trust me, they will appreciate it. There is nothing more difficult for a hiring manager than having a new hire spend the first week of employment reading up on things they should have already known before they started. Do your prep work in advance and you will be a shining star even before you start. And don’t shortchange your classes, thinking that a C or D is enough to get by. Your GPA will still be requested in the future, so don’t allow it drop in your final semester. If you do not yet have your job or internship secured, you already have a full-time job: finding your job. You need to begin shifting your time and priorities from your classes to job searching. Your classes are still important and yes, your GPA does still count, so don’t pull the plug on doing well in your final classes. But before you join the party, you need to earn your right to party. And if you haven’t yet found a job, that is your job for any and every extra hour you have available. If you need help with any phase of your job search, check out the resources at CollegeGrad.com. 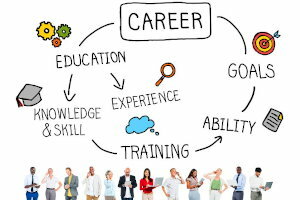 We can help you with career selection, resume preparation, finding entry level jobs, interview prep and offer negotiation. One of the most difficult tasks is finding hiring employers. Take note that if you have waited this long, many employers will have filled most, if not all, of their entry level and internship roles. So the longer you wait, the more difficult the search will become. Yet there are still plenty of employers hiring, which you can find just by doing an entry level or internship job search at our site. But don’t delay further. Don’t wait until after graduation to look for an entry level job. Or until after completion of the school year to look for an internship. The time is now.